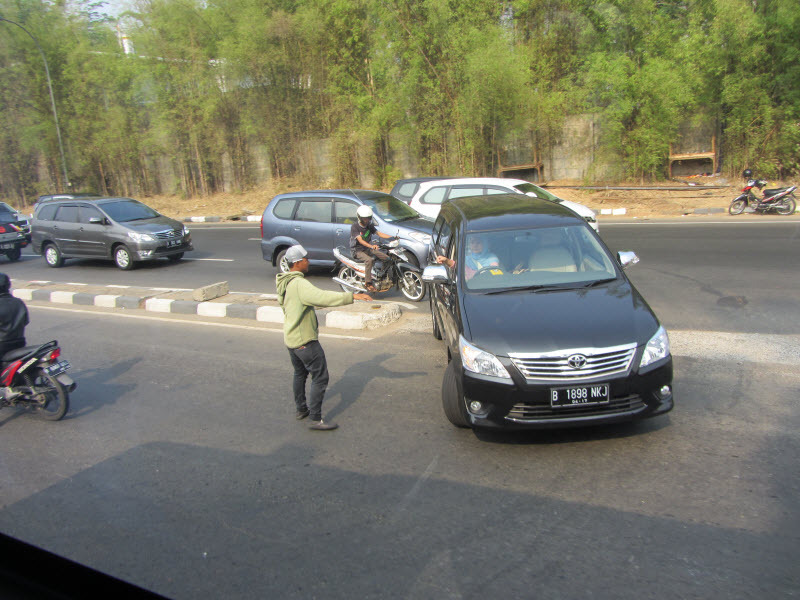 After observing the way Indonesians drive I have come to the conclusion that they have precisely the same amount of patience on the road as Indians. Which is zero. 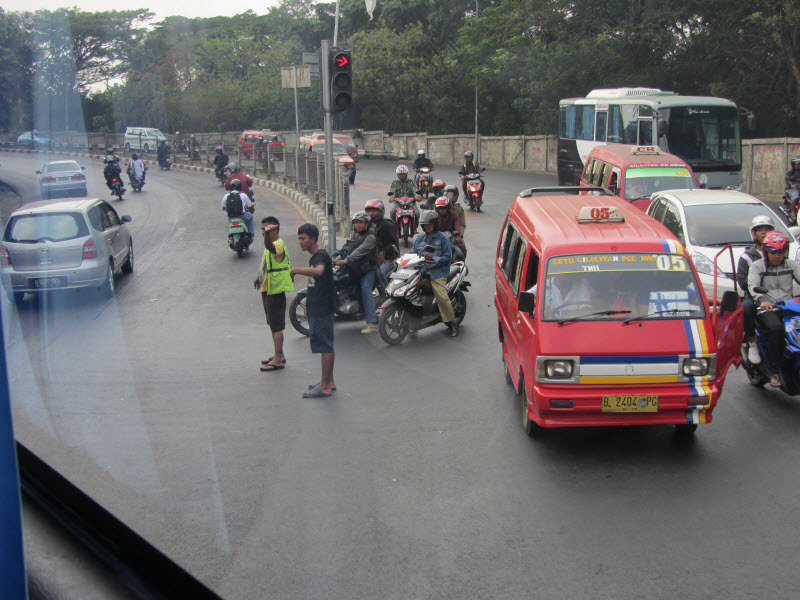 Traffic jams are common here and not just due to the high volume of traffic. But also due to people overtaking where they shouldn’t and causing a deadlock with oncoming traffic. Then someone else squeezes in a vacant spot on the wrong side of the road and pretty soon the road or intersection becomes a mess with vehicles pointing in directions they shouldn’t be pointing in places they shouldn’t be to begin with. This is a common occurrence in India as well and I’m pretty used to it. However, I noticed something really unique in Indonesia. Whenever a jam occurs you will find people come forward and direct traffic as if they were the police. And they actually make a living out of it. It is customary to roll down your window and hand the person a note or coin to thank him for making way for you. Check out this picture. In this case there was no traffic jam. At least not yet. The Toyota wanted to make a U-turn but wasn’t getting a chance causing vehicles behind him to pile up. This guy comes and stands in the middle of road to block oncoming traffic and let’s a few vehicles slide by just enough so that he doesn’t cause a problem on the other side. You can see him reaching for his tip. Here is another instance. This happens in cities as well as villages. Obviously these guys are risking life and limb by standing in the middle of busy roads and orchestrating traffic without any training or authority. But from what I have seen for the past three days it actually works. Here a couple of guys are asking people to take a diversion presumably due to some problem ahead. While I’m on the topic of people standing in the middle of busy roads and highways, I’d like to point out something else. Take a look at this picture. 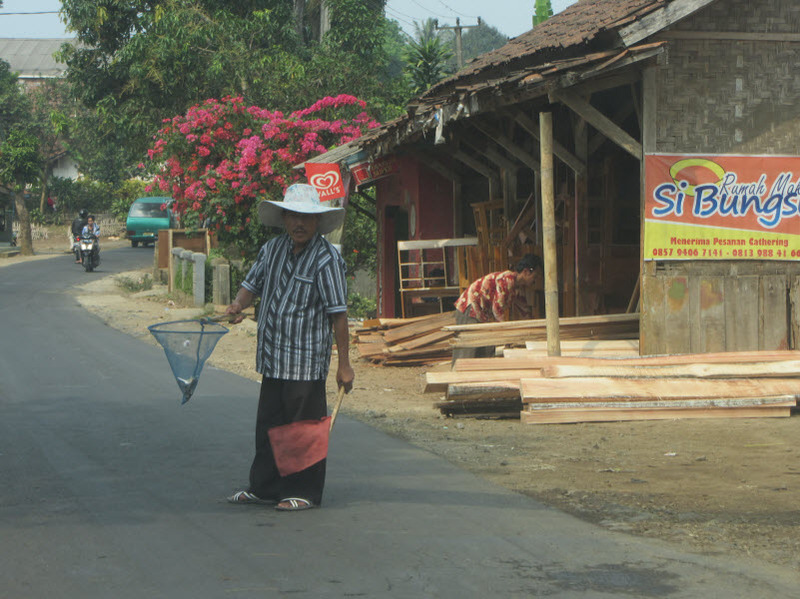 This man is waving a red flag asking people to slow down and put money into his net. I thought it was a pretty aggressive way of begging. I saw this happen in different places and guessed that there was more to it than met the eye. My tour guide let me know that this was the way people collect donations for things like building or maintaining a mosque, a school or something. I have seen this in India as well. But only during festivals when people ask for money for celebrations. 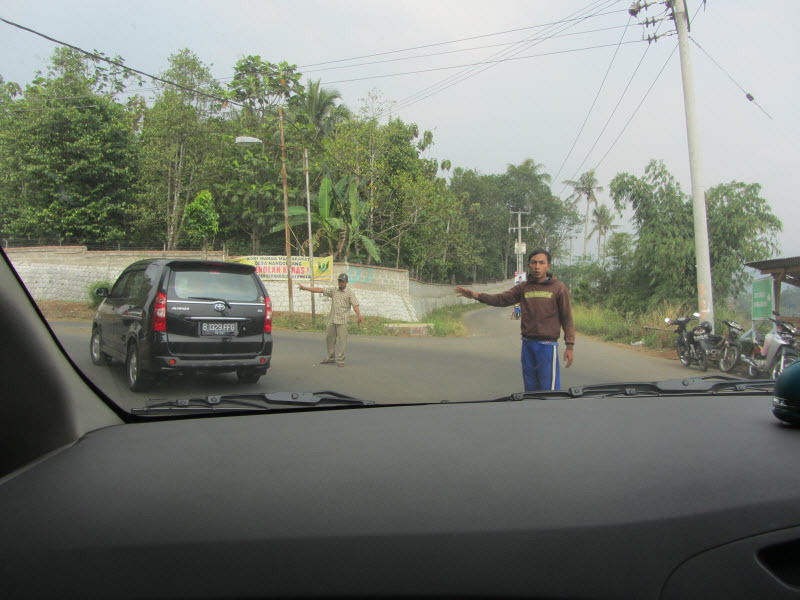 So if you are driving in Indonesia you had better be careful, unless you want someone on your windshield. Because there happen to be quite a few people standing bang in the middle of the road.